Had a reasonable DGR. 130 machines took part. I took some pictures before my camera decided to stop working. The morning was pretty chilly; I was glad I had put my thermal underwear on! I turned back at the halfway point as I was cold and hungry. It's really quite hard work pootling around towns at 20mph, constantly clutching/declutching, wondering if I should jump the red lights, (as many riders were) or risk losing the Peleton. There were no other BSA's, but Norton's, one Velo and a few of old Triumphs, including, a sprung hub model. Just back from the Cambridge UK run, absolutely fantastic day... Many dozens of people lining the streets in Cambridge centre, riding around the old Universities etc plenty of students etc. Must have been 400 or more riders easily but only three BSAs, my A10 another A10 belonging to a guy named Simon who has never heard of our forum and he has had his plunger A10 some six years! so there are still more A10s and 7s out there. The other BSA was a Royal star A60? or 65? not sure. Now I have been boasting about just how well my A10 has performed over the last Summer, but today....sigh! she thought she'd play up a bit. No problem with starting, she just wanted to be a bit lazy on one of her cylinders and run as a single... it... whatever it was... cleared as the engine got hot, so what was that all about?? There were a few other vintage bikes... one being a very nice original Vincent single with all the patina it had collected over the years, such an honest bike! I do like to look at the wear and tear and see how parts have lasted. It was not without its own problems though, only yards from the finish it had stalled and would not start - magneto problems, as always the case, it started easily when cold, made the rider sweat though. Great day at Bristol DGR. The organisers are top quality for the efforts they make so i can feel part of a great cause. Good ride with less in town aggro. Cities aren't great for my clutch and gearbox so was glad of an out of town extension on last year. A10 only cut out once, bless. Was a bit chilly in me tweed jacket but was good fun. Been and done it, dam its cold. 236 riders turned up near Bury St Edmunds and we raised over £17000. Great day well organised. 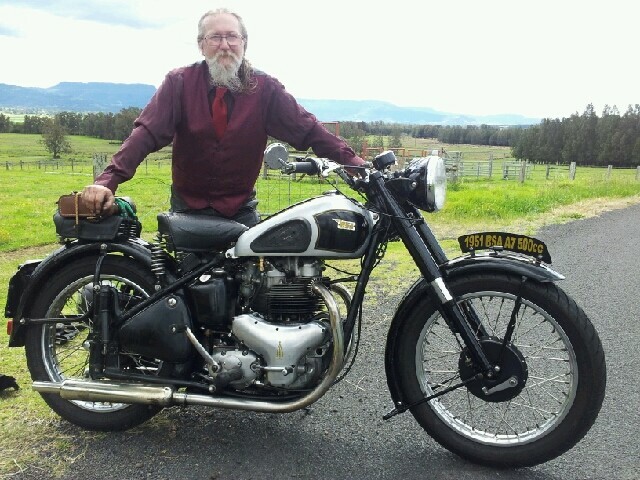 I was the only A there a couple of other BSA’s + a few other oldish bikes, best of the bunch an in line 4 Indian. I was shacking to much to take any pictures my self there are lots here though. My buddy and I went along to Youle's Motorcycles in Manchester. There must have been about 500 bikes on the run to Dukes 92, local Bistro. Pictured, Me (the big bloke) still chewing my breakfast bar and my buddy, Peter, who is also the chairman of the Cheshire BSAOC Branch. An absolutely brilliant day. We were both A10 mounted and our bikes attracted quite a lot of attention as this event is not necessarily for classics. Just had a look at the donation figures nearly 5.7 million . $$$ per rider average. Australia $153.24, USA $152.41, England $149.52. My local ride came in 5th in Australia with $248.75 per rider. Zimbabwe had one rider who raised $364 ! Had a great day with the Hayle (Cornwall) ride. Over 100 riders, nearly closed St Ives when we trickled through. Just got home, The ride was great in Portland Oregon. I would have to look again but last I checked was approx 370 registered. Some might not have showed but other unregistered joined in so confident was in the ballpark. Many rides had zero funds $$$ posted, but there was some exceptional fund raisers locally. Only BSAs locally I saw was very patina'ed M20 Khaki green M20 single and a 68-69 A65.. But a number of new Nortons and about 4 vintage Nortons...Some vintage Triumphs and some asian,, rest all modern, some retro styled. Got some great pictures and had a great time. More soon.. I am VERY tired, as I had a friend come to attend from out of town and between us we raised $375 last I checked, She rode pillion, But afterwards I was a tour guide and we went and showed her the local sights and dinner. This is an article on the Kenyan DGR..one other BSA on the ride, a 1939 M20... both BSA's made from Nairobi to Magadi and back. a total of 220 km and couple 1000 feet difference in altitude (and temperature ). The M20 puffed its way back up they escapement from the desert.. My A10 ran beautifully all the way.. I enjoyed getting it ready for the run, I enjoy the uncertainly that it it would make the run and I super appreciate all the advice and help from you all who helped make it happen.. If there's anyone reading this thread who has resisted joining the DGR (out of over 1000 members there should be, at least, a few resisters reading), Guy's pictures are a perfect explanation of why we, so emphatically, press to get more participants from the forum. Will anyone argue that Guy's pictures are not the most amazing? They show an incredible place and culture that most of us will never get to visit. Also, shows that support for the cause reaches everywhere, and it doesn't hurt that the support, in this case, is fun. Thank you Richard, All are welcome next year. Kenya Airways, British Airways and a few others do a direct cargo/passenger flight to Nairobi if anyone's interested in joining us next year..
Wow Guy, those photos and video are great! I wish I could have done that ride. Hey Guy, thanks for the DGR report from Kenya, what a write up! and a video to top it all, brilliant stuff. A long ride just to get to a ride! In spite of all the hazards that we face in motorcycling... I'd be afraid that some Leopard, Cheetah or some other would jump out at me. Here are a couple of photos up front of me getting into my DGR story. The first is a picture of some old guy in David Byrne's jacket watching the days go by while touching my bike. He seems to have the posture of a guy who spent most of the night before, and a good part of the morning, laying on the garage floor. The second is the obligatory right side A10 picture. The the girl who took the other picture is sitting on her Honda. I had the troubling position of riding behind her a good deal of the way. P.S. The the third pic is an edit to this post. It was clipped from someones YouTube video.